This project aims to digitize daily discharge, total suspended sediment, rainfall, and evaporation data measured at Chinese stations until 1987. They are currently available in book form only and we aim to make them available digitally to facilitate easier analysis of Chinese rivers using measured data. 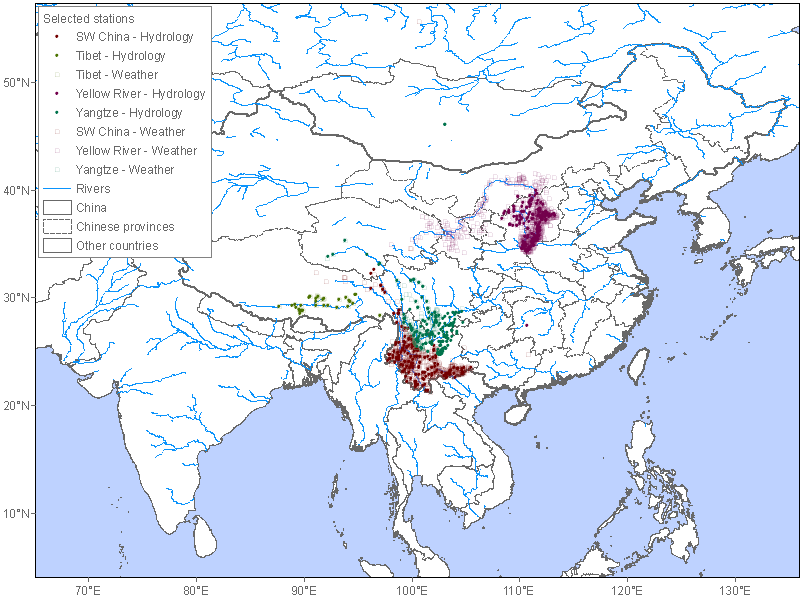 If you use these data please cite this paper, . .
Henck, A., Huntington, K., Stone, J. O., Montgomery, D. R., and Hallet, B., Spatial controls on erosion in the Three Rivers region, western China, Earth and Planetary Science Letters, v. 303, p. 71-83, doi:10.1016/j.epsl.2010.12.038, 2011. Henck, A. H., Montgomery, D. R., Huntington, K. W., and Liang, C., Monsoon control of effective discharge, Yunnan and Tibet, Geology, v. 38, p. 975-978, 2010. Disclaimer: This project is ongoing and the data are still being digitized. At the time of publishing only the Yunnan-Tibet International Rivers data for discharge and sediment concentration are available (districts 9-1 and 9-2).